A career day, which was hosted by the Progressive International Boat Show for the first time, drew more than 90 students. 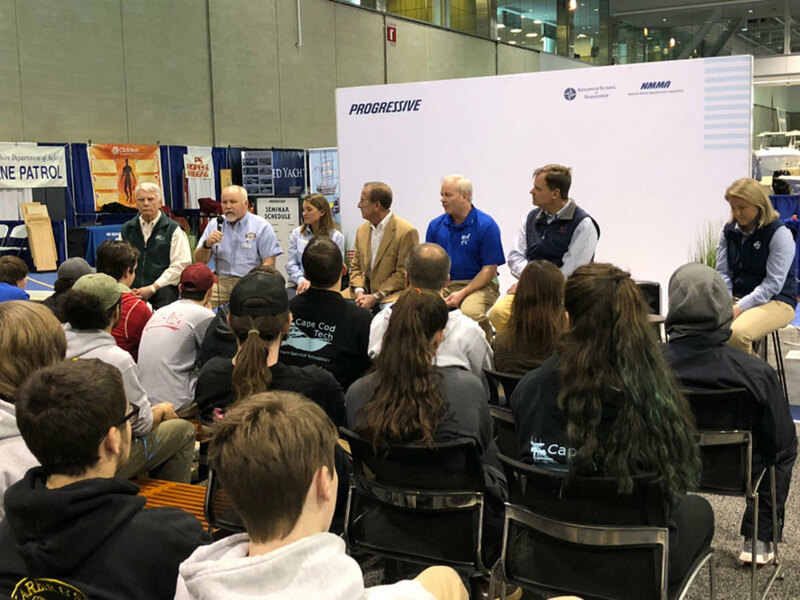 That was the message 3A Marine founder Ed Lofgren gave to students who gathered at the New England International Boat Show to learn about potential careers in the marine industry. Lofgren had intended to blanket the South shore of Massachusetts with two additional dealerships, but has been unable to attain his dream, he told a group of about 90 students from Cape Cod, Boston and Maine. Check out a video of Lofgren’s presentation here. 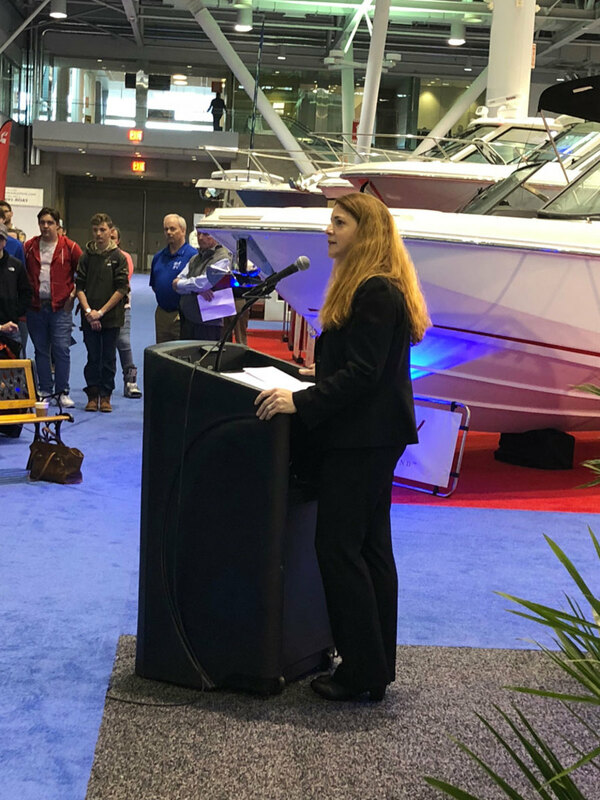 The marine industry is important to Massachusetts, said state labor secretary Rosalin Acosta, who addressed the students Monday morning. Massachusetts labor secretary Rosalin Acosta told marine tech students that showing up on time, looking people in the eye, and having good people skills are all just as important as technical knowhow. The other 70 percent of what employers look for is “soft skills,” she told them. “They want to know that you want to be there,” Acosta said. Acosta emphasized that careers often take new paths, and that though kids had career opportunities without needing four-year degrees, they might choose to obtain one later, and potentially return to the industry in a different capacity. 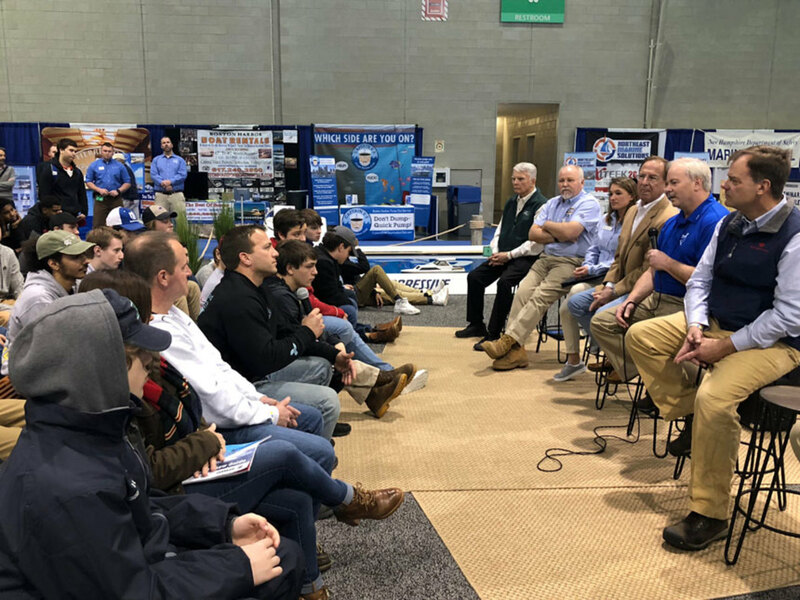 Students of all ages, from young high school to returning adult learners, seemed engaged in the stories from panelists and speakers who explained their sometimes meandering paths into the marine industry. Massachusetts Marine Trade Association executive director Randall Lyons explained how he’d cleaned heads at a marina during summers before moving on to other positions. Students had several questions, from asking the most expensive boat sold to wanting to know if experience from a prior career in project management could be useful in the marine industry. Panelists included Alyssa Linkamper of Brewer Onset Bay Marina, who began her career in the military; Stephanie McLaughlin of Brewer Plymouth; Goose Hummock lead service manager John Bernier; Lofgren; Tim Moll, regional vice president of New England and East for Safe Harbor Marinas; Scott Smith, principal at Boston BoatWorks LLC, the company that builds MJM Yachts; Boston Whaler regional sales manager Doug Nettles; and Larry Russo with MarineMax Russo.